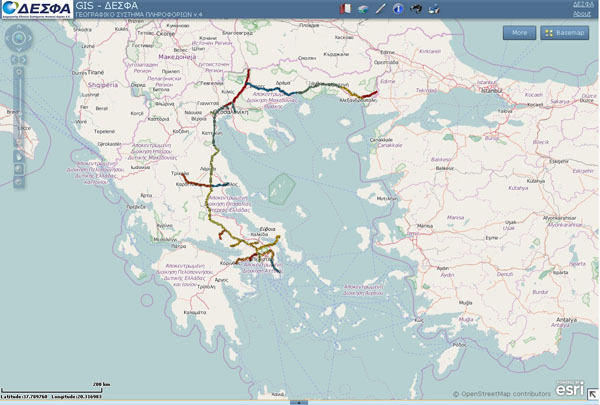 The National Natural Gas Transmission System transports gas from the Greek-Bulgarian border (upstream TSO BULGARTRANSGAZ) and the Greek-Turkish border (upstream TSO BOTAS) to consumers in continental Greece. The Remote Control and Communication System. The main transmission pipeline with total length 512km and design pressure 70 barg extends from the Greek-Bulgarian border at Promachonas to Attica. Transmission branches with total length 952 km extend from the main transmission pipeline and supply natural gas to the regions of Eastern Macedonia, Thrace, Thessaloniki, Platy, Volos, Trikala, Oinofyta, Antikyra, Aliveri, Korinthos, Megalopoli, Thisvi and Attica. Fiber Optic Cable for the remote supervision, control and communications system. The Operation and Maintenance Center of Southern Greece is located at Patima Elefsina in Attica. It covers the area of the main transmission pipeline from Mavroneri Scraper Station in Viotia up to Mandra Line Valve. It also covers the high pressure pipelines of Antikyra, Aliveri, Lavrio, Keratsini, Oinofyta, Heron, Thisvi and ELPE Elefsina. The operating facilities of the Operation and Maintenance Center include 212 km of 30″ diameter high pressure natural gas pipeline, 12 km of 24″ diameter high pressure natural gas pipeline, 127 km of 20″ diameter high pressure natural gas pipeline, 20 km of 10″ diameter high pressure natural gas pipeline, 3 km of 14″ diameter high pressure natural gas pipeline and 6.5 km of 6″ diameter high pressure natural gas pipeline. There are twenty two (22) Scraper Stations, twenty one (21) Line Valve Stations, and twenty one (21) Metering and/or Regulating Stations in the region of the Operation and Maintenance Center. In addition, the main Gas Control and Dispatching Center of the national transmission system is installed in the premises of the Operation and Maintenance Center of Southern Greece. The operation and maintenance of all the facilities in the region of the Center aiming at the orderly operation of the system and the uninterrupted transmission and supply of natural gas to consumers. The Operation and Maintenance Center of Central Greece is located near Ambelia in the area of Farsala town. It covers the area of the main transmission pipeline from Platamonas Scraper Station in Pieria up to Mavroneri Scraper Station inViotia. It also covers the high pressure pipelines of Volos and Trikala. The operating facilities of the Operation and Maintenance Center include 206 km of 30″ diameter high pressure natural gas pipeline, 40 km of 10″ diameter high pressure natural gas pipeline of Volos branch and 72 km of 10″ diameter high pressure natural gas pipeline of Trikala branch. There are six (6) Scraper Stations, fourteen (14) Line Valve Stations and nine (9) Metering and/or Regulating Stations in the region of the Operation and Maintenance Center. The Operation and Maintenance Center of Northern Greece is located at Nea Mesimvria near Thessaloniki. It covers the area of the main transmission pipeline from Karperi Station near the city of Serres up to Platamonas Scraper Station in Pieria. It also covers the high pressure pipelines of EKO, Asvestochori and Platy. The operating facilities of the Operation and Maintenance Center include 38 km of 36″ diameter high pressure natural gas pipeline, 92 km of 30″ diameter high pressure natural gas pipeline, 32.5 km of 24″ diameter high pressure natural gas pipeline and 13 km of 10″ diameter high pressure natural gas pipeline. There are ten (10) Scraper Stations, six (6) Line Valve Stations and seven (7) Metering and/or Regulating Stations in the region of the Operation and Maintenance Center. In addition, the backup Gas Control and Dispatching Center of the national transmission system is installed in the premises of the Operation and Maintenance Center of Northern Greece. The Operation and Maintenance Center of Eastern Greece is located 5 km away from the city of Xanthi at the 2nd km of Diomedia-Lefki road. It covers the segment of the Karperi-Kipi branch from Paleochori Line Valve Station up to Border Metering Station at Kipi, near Evros River and the Greek – Turkish border. The operating facilities of the Operation and Maintenance Center include 87 km of 36″ diameter high pressure natural gas pipeline and 145 km of 24″ diameter high pressure natural gas pipeline. There are six (6) Scraper Stations, fifteen (15) Line Valve Stations and seven (7) Metering and/or Regulating Stations in the region of the Operation and Maintenance Center. In addition, the operation and maintenance of the Border Metering Station at Kipi is performed by the Operation and Maintenance Center of Eastern Greece. The Operation and Maintenance Center of Border Metering Station at Sidirokastro is located in the municipality of Sindiki near Sidirokastro town, 12 km away from the Greek-Bulgarian border. 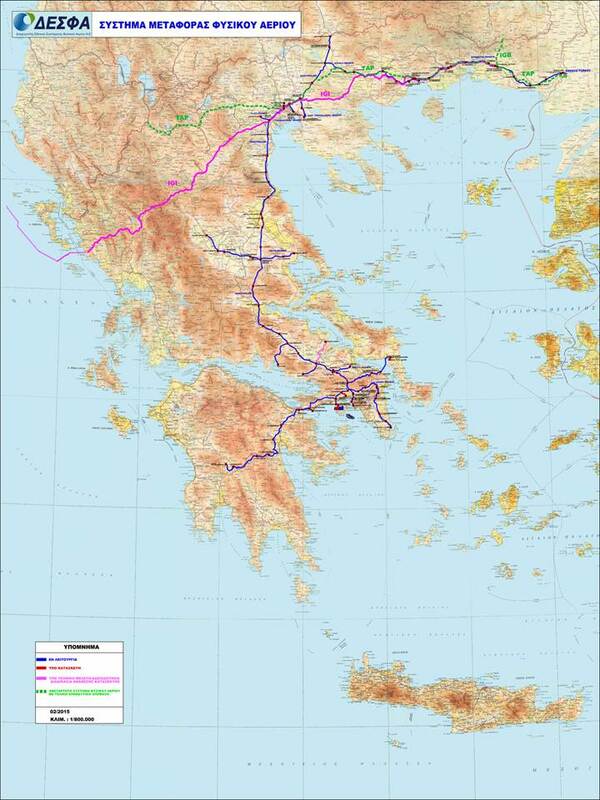 It covers the area of the main transmission pipeline from Promakhonas Scraper Station at the Greek -Bulgarian border up to Karperi Station near the city of Serres and the segment of Karperi-Kipi branch from Karperi Scraper Station up to Line Valve Station of Fotolivos near the city of Drama. The operating facilities of the Operation and Maintenance Center include 30 km of 36″ diameter high pressure natural gas pipeline and 70 km of 24″ diameter high pressure natural gas pipeline. There are five (5) Scraper Stations, four (4) Line Valve Stations and two (2) Metering and/or Regulating Stations in the region of the Operation and Maintenance Center. In addition, the operation and maintenance of the Border Metering Station at Sidirokastro is performed by the Operation and Maintenance Center at Sidirokastro. The Operation and Maintenance Center of Peloponnisos is located at Spathovouni, Korinth. It covers the area of the main transmission pipeline from LNG Terminal Scraper Station on the island of Revythousa up to PPC Megalopoli Metering Station. The operating facilities of the Operation and Maintenance Center include 68 km of 30″ diameter high pressure natural gas pipeline, 156 km of 24″ diameter high pressure natural gas pipeline. There are four (4) Scraper Stations, six (6) Line Valve Stations and four (4) Metering and/or Regulating Stations in the region of the Operation and Maintenance Center. The Metering and/or Regulating Stations reduce and regulate the downstream pressure, measure the quantity of energy transferred from the natural gas transmission system to the medium pressure networks or to consumers connected directly to the transmission system and add a distinctive odour to the natural gas for prompt detection of any gas leakage (when required by the national and international regulations). Facilities to add the distinctive odour. The Border Metering Station at Sidirokastro is located 12 km away from the Greek -Bulgarian border, in the Municipality of Sidiki near Sidirokastro town. Regulation of gas supply to the Greek network according to the programme of the Gas Control and Dispatching Center. The station operates 24 hours per day with round-the-clock shifts. The supervision of the operation of the station and all the important controls are performed from the local control room by means of a Distributed Control System (DCS).The quantity of natural gas is measured by five (5) parallel metering lines with orifice, each equipped with two independent electronic measuring systems and one additional independent mechanical measuring system. The quality of the natural gas is measured by installed Gas Chromatographs and Analyzers such that there is continuous control of the gas composition, density, content in sulphurs, water dew point (WDP) and hydrocarbon dew point (HDP). Based on these measurements, the calorific value, density, compressibility factor and other important gas properties are computed. The Border Metering Station at Kipi is located 3.5 km away from Evros River and the Greek – Turkish border, in the Municipality of Ferres near Peplo village. 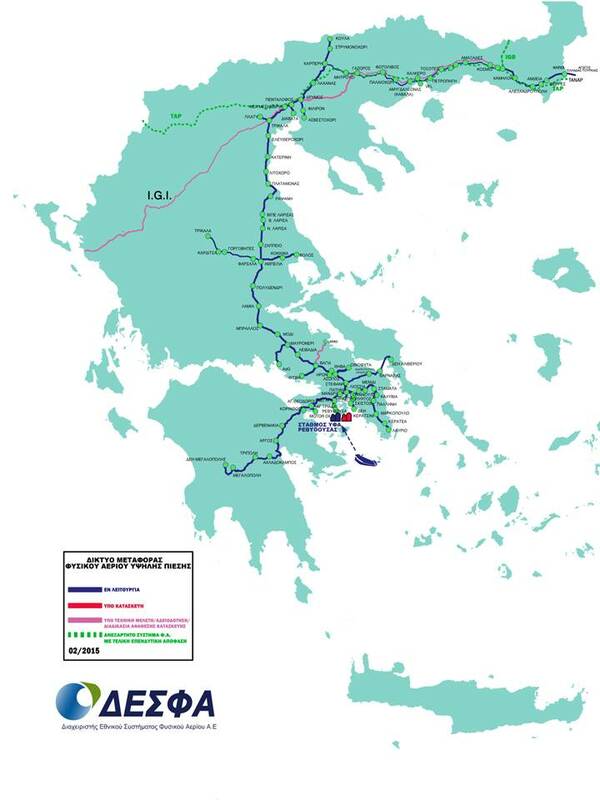 Regulation of gas supply to the Greek network with three (3) regulating lines according to the programme of the Gas Control and Dispatching Center. The station operates 24 hours per day without shift personnel. The supervision of the operation of the station and all the important controls are performed remotely from the SCADA system in the Gas Control and Dispatching Center at Patima Magoulas. The quantity of natural gas is measured by three (3) parallel metering lines equipped with turbine and ultrasonic meters. The compression station is located next to the Operation & Maintenance Center of Northern Greece at the main pipeline of the National Natural Gas Transmission System (NNGTS) (kilometric position 414), where the pipelineʼs diameter changes from 36” to 30”. The function of the compression station is to provide additional compression required in the NNGTS to satisfy the needs of Natural Gas Market in Greece. The station is designed for unmanned operation with remote control and supervision from the DESFAʼs Main Dispatching Center in Patima Elefsina. A local Station Control Room (SCR) is located at the DESFAʼs Backup Dispatching Centre in Nea Messimvria. The operation of the station started on December 2012. Two compression units consisting of a centrifugal compressor (SOLAR 453) and gasturbine (SOLAR TAURUS 70) of 7,7 MW power each one in operation and one in backup. Two separation filters for separating liquids and filtration / purification of natural gas (one in operation and one in standby mode) and condensate collectors. Coolers at the outlet of the compressor to regulate the temperature of the gas. Medium voltage substation (MT) (2 * 1000 kVA) lightning protection and protection from voltage drops. Emissions CO<25 ppmV, NOx<25 ppmV, UHC<10ppmV. Noise: 85 dB at 1 m distance, 65 dB within the limits of the land station. Telemetry System / DCS for the turbine- compressor pair, engine performance map, and system load sharing. The operational parameters of the National Natural Gas Transmission System are controlled continuously and programmed by the main Gas Control and Dispatching Center, located in the premises of the Operation and Maintenance Center of the Southern Sector at Patima Magoulas near Athens and alternatively (in the event of loss of the main Gas Control and Dispatching Center) by the backup Gas Control and Dispatching Center located in the premises of the Operation and Maintenance Center of the Northern Sector at Nea Mesimvria near Thessaloniki. Support and coordination of the maintenance personnel and the Authorities (Fire Brigade, Police) in cases of emergency. “the remote supervision of the natural gas stations, the management of the alarms and the acquisition of technical and statistical data to the departments of DESFA such that the transmission of natural gas is performed in a safe, reliable and cost-effective manner”. Cluster of three IP call managers, installed in the Headquarters, the Operation and Maintenance Center at Patima and the Operation and Maintenance Center at Nea Mesimvria for the operation of all internal and external telephone calls of DESFA. DESFA innovator in technology and service issues has developed an internal GIS to complete recording in digital form of his assets. The GIS technology enables us to faster and better understanding of the current situation of high pressure gas network. The operation of GIS- DESFA application separated into Desktop environment and the Web environment. The information entered into the GIS cover all NNGS (National Natural Gas Systems). A metallic pipeline and its appurtenances are covered by special coatings to provide protection against mechanical wear and corrosion. A Cathodic Protection System against corrosion is in operation on the pipeline. Generally, the Cathodic Protection System contributes to a safe and economic gas transmission. the operation and inspection of the earthing electrodes and the associated protective equipment against adverse electrical interferences. In the NGTS there are totally 37 T/R Stations, approximately 1700 Test Posts, 200 monolithic insulating joints and 300 insulating flanges, 138 casings, 492 pipeline earthing sites, 93 earthing systems at fenced stations (e.g. Line Valve Stations etc.). A Surge/Lightning Protection System with Explosion Proof and Intrinsic Safety Systems has been installed. The Surge/Lightning Protection System is mainly divided into external and internal lightning protection. The electrical and electronic equipment is protected by an Internal Lightning Protection System mainly consisting of Surge Protective Devices (SPDs) linked with Intrinsic Safety Systems where appropriate. All protection systems are inspected based on DESFA Procedures and international standards/guidelines.